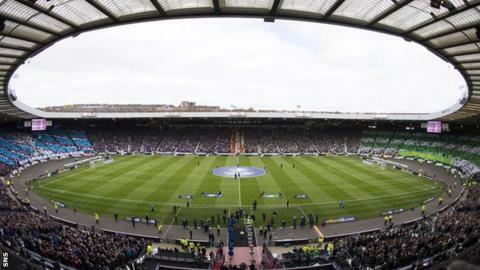 Queen's Park have challenged the Scottish FA to justify its claim that retaining Hampden Park as the national stadium would cost "many millions". "We have to date had no detailed access to any evidence to substantiate this statement," said the Scottish League One club, who own the stadium. And they want the SFA to reveal the comparative cost of leaving Hampden. The governing body is considering alternatives before its current lease expires in 2020. An SFA delegation this month visited the national rugby stadium, Murrayfield in Edinburgh, which recently hosted home games by Hearts, amid discussions with Scottish Rugby. It has also received proposals from Celtic and Rangers, whose stadiums have also recently hosted international matches, as well as Queen's Park themselves. The Spiders, who remain an amateur club and are celebrating their 150th anniversary, say comments made by SFA chief executive Stewart Regan to BBC Scotland had caused them "great concern". They said in a website statement that they "would seek confirmation from the Scottish FA that they have fulfilled their responsibilities, under the present lease, to maintain the stadium and further detailed evidence to support Mr Regan's statement". "Whilst Mr Regan has stated it would take many many millions of pounds to remain at Hampden, he has not clarified how much it would cost the Scottish FA to leave Hampden," they said. "For the past 17 years, the stadium has been successfully operated by Hampden Park Ltd, a wholly owned subsidiary of the Scottish FA, with many areas of revenue generation, including sponsors, naming rights, third party rentals and concerts. "The present lease arrangements allow the Scottish FA to work independently with a vast degree of flexibility and the ability and freedom, for example, to bid and be awarded matches from the Uefa 2020 Euros." Regan had said that the SFA was exploring the pros and cons of leaving Hampden but that staying would require external funding from public and private bodies. Queen's Park responded by suggesting that Hampden Park is an economic asset to Glasgow and Scotland - and that this should be taken into consideration by the SFA. "The decision to remain or leave cannot be based purely on cost," they add. "The City of Glasgow and, indeed, Scotland could be greatly affected by the loss of the iconic Hampden Park, recognised worldwide as the home of Scottish football. "Queen's Park would further like to clarify that recent reports of rental of £800,000 per annum being paid to Queen's Park are incorrect. "Under the present lease agreement, a confidentiality clause prohibits us from making public the rental amount. "However, we can say it is much much less the £800,000 per annum paid directly to Queen's Park. "The vast proportion of the rental is retained by the Scottish FA to maintain the stadium." The SFA has been approached for a comment.